My concepts of self worth and degradation somehow became intertwined, as I felt disappointed if I did not receive unsolicited advances. The first time I stepped foot in a party hosted by members of the men’s basketball team, I became distinctly aware that I was out of my depth. I was unsure if it was due to my upbringing in Vienna, Austria, or if this was a part of standard collegiate life, but I remember feeling unsafe. This is what college is, I thought. I guess it really is like those sexual assault prevention videos. I was a freshman, and had just joined the women’s basketball team as a walk-on player. I had overwhelmingly positive interactions with the women on that team. It was horrifying to see my friends being cornered, groped, and barraged with sexual advances, primarily by the members of the men’s basketball team. It wasn’t until sophomore year, after quitting the team in pursuit of better time management, that I realized the toxic environment I had accepted as normal was in fact an unacceptable trend on campuses across the country. I have had countless valued interactions with male athletes, and I believe they are good people in isolation. The culture created by their interactions as a group is less indicative of their individual character and more of the pervasiveness of masculinity as performance and their willingness to buy into it. 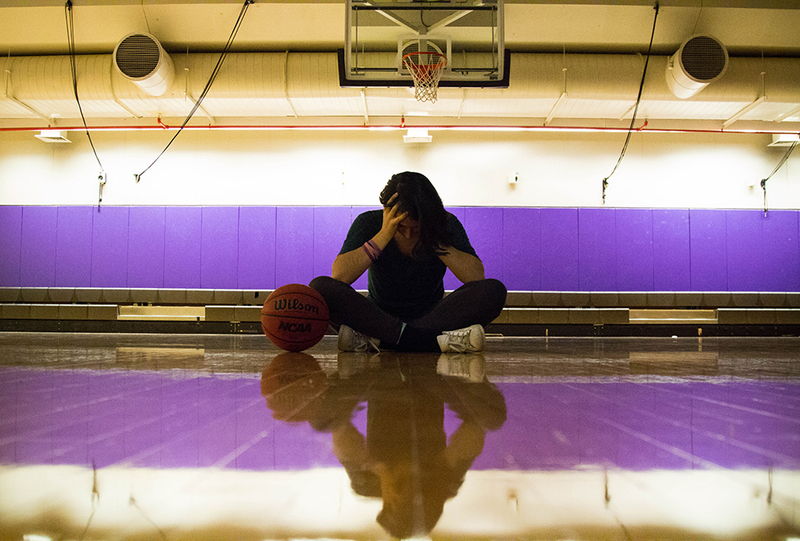 The performative attitude of the men’s basketball team is part of a larger, unchecked culture of toxic masculinity at Emerson that is harmful to the mental health of all involved. As researchers posit in “Overdoing Gender: A Test of the Masculine Overcompensation Thesis,” “Men’s pursuit of masculinity in the face of threats is driven by the desire to recover masculine status both in their own and others’ eyes.” In Emerson’s athletic sphere, where there is any number of perceived threats—whether it be the school’s Division III status, teams’ rank within that division, or teammates themselves—there is a distinct tenor of performance both on and off the court for the approval of other men, often to the detriment of women. Though athletes at Emerson College make up only 6.2 percent of the entire student body, this small pocket of the school’s population has a huge impact on the social life of the school as a whole. A member of the men’s basketball team once mentioned to me that Emerson is ‘the perfect set up’ as he can get whatever girl he wants, because there are so few straight men at Emerson. He added that “the basketball thing” makes him all the more masculine and appealing. These mentalities pollute the inclusive environment Emerson aims to foster and teach incoming athletes and outsiders embedded in the athletic community toxic attitudes. I do not believe members of Emerson’s basketball team are inherently misogynist, but the environment in which they undergo crucial stages of development produces an unhealthy attitude toward women. At the athletic parties I attended freshman year, I did not experience the blatant sexual harassment faced by some of my former teammates, and generally experienced less direct degradation than many of them during my time on the team. While my teammates were pursued relentlessly, treated disrespectfully, and shamed by people they trusted, I experienced only the occasional possessive arm grab or unwanted advance. Though my experience was not as abrasive as those of my teammates, it lead me to develop an unhealthy relationship with male attention. I began to feel bad about myself if I was not approached—if I was not harassed. I became jealous of the women on the team who received attention. My concepts of self worth and degradation somehow became intertwined, as I felt disappointed if I did not receive unsolicited advances: It’s not that I want to hook up with any of them. I wanted them to notice me enough for me to turn them down. The men’s gaze was one of an expert predator: so fixated on their target that all others became invisible. In the process of making myself more appealing to men who would ultimately disrespect me, I vanished into the periphery, becoming invisible to myself. Male gaze and performance is a double edged sword—not only does it directly harm the women subjected to it, but it turns women against each other in pursuit of men who continuously disrespect them. Fortunately, I was able to remove myself from the situation. I quit the basketball team, primarily for academic reasons, but soon realized the positive effects it had on my psyche. Though I initially missed the time spent with friends on the women’s team, I am now able to receive love and support from them without the competitive attitude I had previously assumed. I write this because and on behalf of those women, as the issues I’ve raised with the men’s team still impact their lives. It is only after leaving that I see the need for accountability. If you see echoes of yourself in this article, I am holding you accountable, whether enactor, enabler or bystander—you must hold yourself accountable. Men must no longer blindly defend their friends who have behaved badly, and must learn to watch out for dangerous situations at social gatherings. A modicum more of awareness will work wonders. I am not alone in my requests, nor in my experience. All people affected by toxic masculinity ask only for respect and in order to achieve that, there must be change. The Emerson administration can only do so much. The athletics department can only hold so many compliance meetings. Real change has to come from the student body and all students who participate in the athletic social scene. I will no longer allow myself and the people I love to be disrespected for the sake of social acceptance.